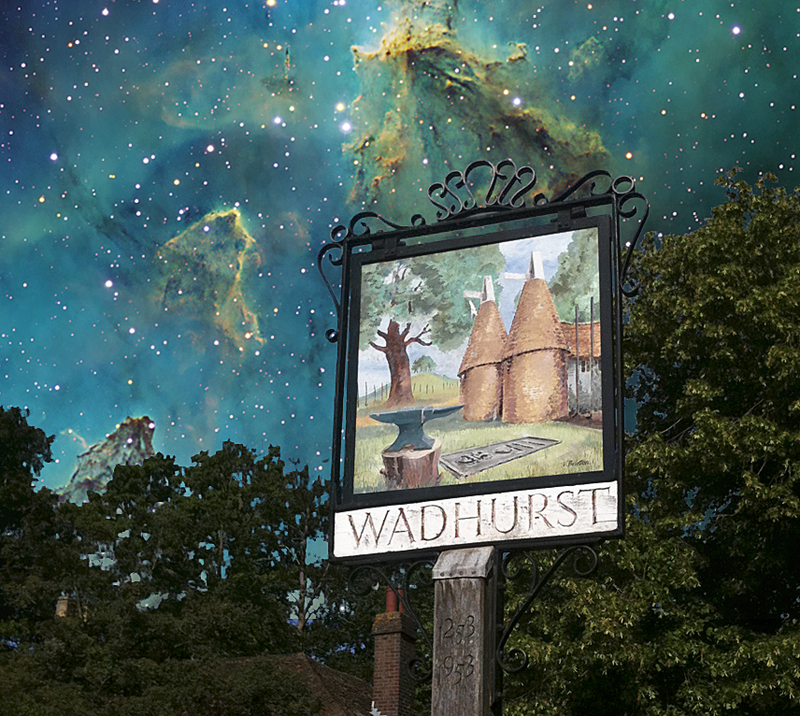 I had a wonderful opportunity in May, 2011 to visit the small town of Wadhurst in the UK to give two workshops on image processing in astrophotography to the Wadhurst Astro Club. It is a delightful area about 40 miles south of London and 7 miles south of Tunbridge Wells. My wife and I actually stayed in a pub. After unpacking, we decided to take a walk and came across a very interesting sign. I only had my iPhone with me, so I captured a picture of the sign. It had a picture of a very old house. There were two dates on the post; 1253 and 1953. Doing a bit of historical digging, it turns out that Wadhurst was Wadeherst (Anglo-Saxon) in early records and probably derives from Wada, which is believed to be the name of a Saxon tribe who populated the area and cleared it of trees in the 7th or 8th century. Henry III granted Wadhurst its charter in 1253. Aha! So, my guess is that sign was put up in 1953 commemorating the 700th anniversary of the town charter. In recognition of its antiquity, I decided to add something even older to the picture. I added my tricolor narrowband image of Melotte 15 in the Heart nebula, IC 1805, to the sky background. One of the things that I’ve learned in presenting astrophotographs over the years is that many people not involved in astronomy have some difficulty relating to images of galaxies or nebula. There is no common frame of reference. We do not see these objects in our everyday lives. I’ve already discussed the issue that we make the invisible visible in astrophotography, since all of these objects are too weak to activate our color vision, even in large telescopes. So, we amplify the signals in our computers to show you what the object would look like if we had more sensitive color vision. Still, these objects are outside our evolved frame of reference. So, by combining a terrestial scene, something we can relate to, with the astronomical object, we now gain that frame of reference. Certainly, this is a different form of the art, but I hope that you like it.